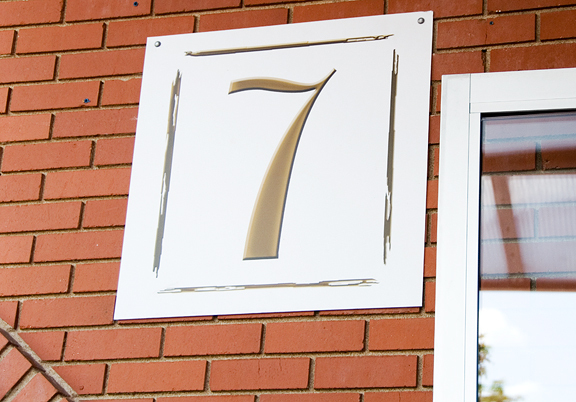 I had never heard of Seven before, even though I walked past it several dozen times in the last two years. It is crammed into Pearl Street between several other restaurants, and it neighbors one of my favorites, The Kitchen. Seven piqued my interest because it was the only restaurant sponsor of the Boulder Wine Festival that I was not familiar with. Their Latin/Asian menu appealed to me because I love both cuisines. 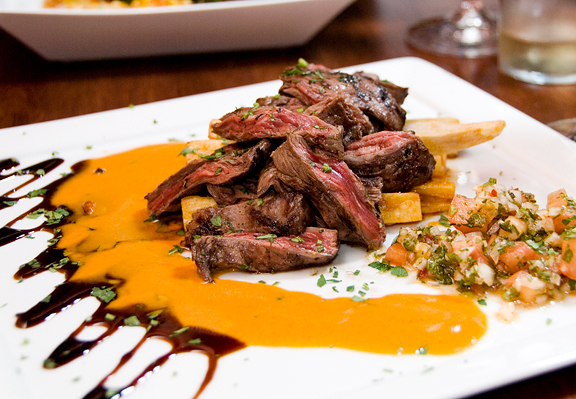 Their chef is from Argentina and well… no one knows their beef like an Argentine. Upon my arrival I was greeted by a Young Urban Hipster (YUH) who seated me outside (per my request for better lighting). Turns out he was also the sommelier and part-owner, Phil Armstrong. Imagine my surprise! The overall feel of Seven is that ubiquitous vibe of Boulder, YUH. I’m not partial to that scene, but I appreciated how laid back and casual the atmosphere was while the dedication to food quality was unrelenting. The wait staff was polite, attentive, and if they hadn’t been serving me, I would have mistaken them for another YUH patron. Previewing the menu online had me in a conundrum because I wanted to order 15 plates. I skipped lunch and settled on ordering 5 between us (not including dessert – and I’ll get to that debauchery in due time). 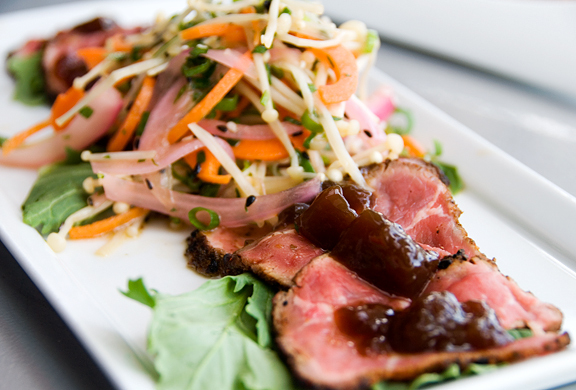 We began with the togarashi beef tataki ($8), served with a deliciously fresh, light, and zippy enoki, daikon, pickled onion, carrot, and mizuna salad. The beef is crusted in togarashi (Japanese 7 spice) and then just seared. Sliced ever so thin, it was topped with ponzu jelly which hits your tongue first with a burst of citrus sour and salt. The incredibly tender beef was fresh and well matched with the salad and the ponzu. Excellent combination of flavors. I asked Phil if he could arrange to pair half-glasses for us with our courses, which he enthusiastically agreed to do. I like that kind of flexibility in a restaurant and I could tell Phil was genuinely excited to tackle the challenge. And a challenge it was, because we ordered beef and ceviche for our first courses and he came up with a real winner of a white: Casamaro Blanco 2006 from Spain ($7 for a glass) with a fresh tangy chew and a long finish. He split the glass between two for each of us. It worked beautifully with the beef and the flavors levitated in my mouth. I should have started with the ceviche and then the beef, but I couldn’t help myself because the beef looked That Good. Anyway, the grouper ceviche martini ($8) packed quite a bit into one glass! The chunks of grouper were just that, chunks, not tiny little scraps. That’s the sign of confidence in the freshness of your fish. There was not a trace of fishiness. The texture was firm, the taste fresh, and yet it yielded easily in the mouth. Good fish. I didn’t care for the carrots in the mix (it didn’t take away from it, but it didn’t add to it) although the citrus sambal was nice and tart the way I like it. 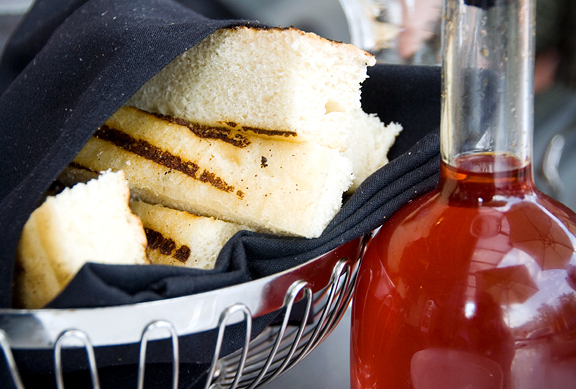 Paired with the Casamaro Blanco, it was a strong and refreshing taste – neither one dominating the other. 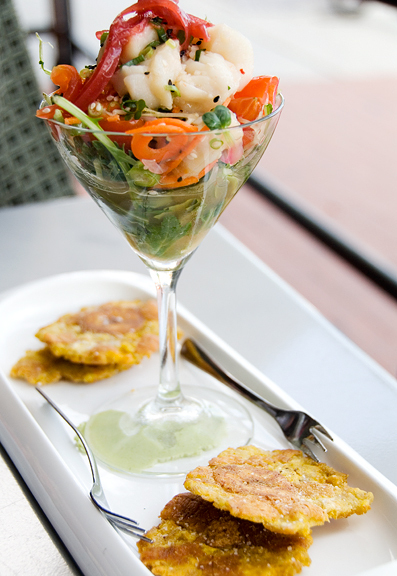 Four ginger tostones (fried plaintains) accompanied the ceviche. The tostones were nice and crispy on the outside with enough meat to be starchy and satisfying. They were lightly seasoned with salt and excellent taken with some wasabi (under the martini glass) for zing. The bread was heavily neglected in part because we didn’t want to “fill up on bread”, but also because it was on the dense side. The slices came grilled with a touch of salt and some sun-dried tomato and red pepper infused olive oil. I felt neutral about it at best. I did ask Phil about Seven and why there was so little information on it online. It used to be Seven Eurobar until recently. Phil came into the Boulder scene in the past year or two and took over the restaurant. 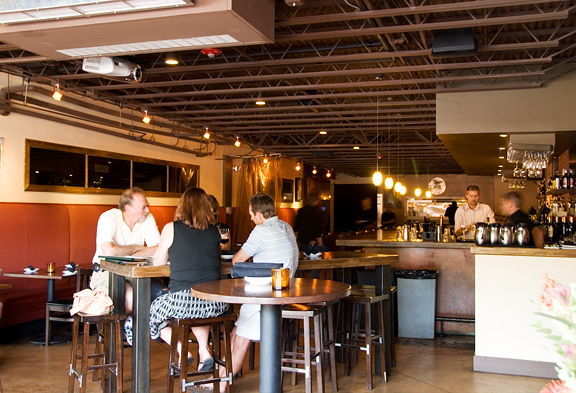 In February 2007, they rebranded as Seven and their focus is on a solid and consistent dining experience in an effort to move beyond the “eurobar” and get the word out. They had a great deal that evening for tasting flights (that night was wines from Argentina) and getting a mini sampler of the savory and sweet plates for $25. The restaurant was about 60% full on a Wednesday at 7:00 pm. My initial reaction to a menu that offers first, second, and main courses was that it sounded excessive. I had assumed that because the prices were more reasonable, that the plates must be smaller. I was wrong. The plates offer as much as if not more than many restaurants in the Boulder area. We had ordered a second course to share, the green bamboo rice sushi roll ($10) filled with spicy ahi tuna, cucumber, and chipotle mayonnaise. The cut roll was topped with tempura batter and served with ponzu citrus soy sauce and aoili masago, and some more of that fabulous enoki salad. The dominant flavor was the green tea in the sticky rice. I really had trouble tasting the spicy or the ahi tuna, which is a shame. Even the cucumber was stronger than the tuna (actually, that’s a sign of a good cucumber – when you can taste it). The tempura batter bits were over-fried and on the darkish side – I like my tempura light. It was not a bad roll, per se, just that I wish I had ordered the Japanese seven spice calamari or the kimchee crab cakes or the smoked pork “sushi roll” instead. See the problem? Too many tantalizing choices on the menu. 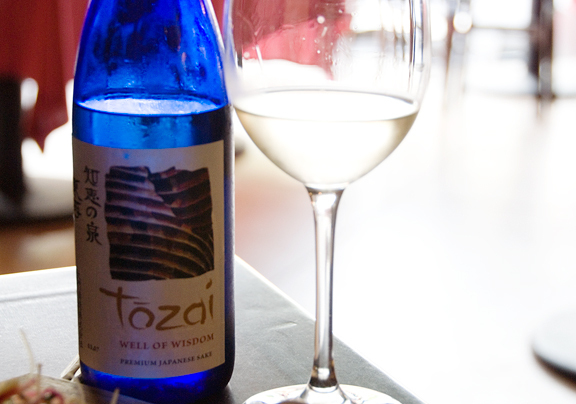 For our second course, Phil brought a glass of Tozai “Well of Wisdom” premium Japanese sake ($8). Jeremy is not a fan of sake – it reminds him of that Chinese fermented rice dish. I actually like sake because it reminds me of that Chinese fermented rice dish. However, my palate isn’t discerning enough to know a really good sake from a mediocre sake, so I will just say it was good. 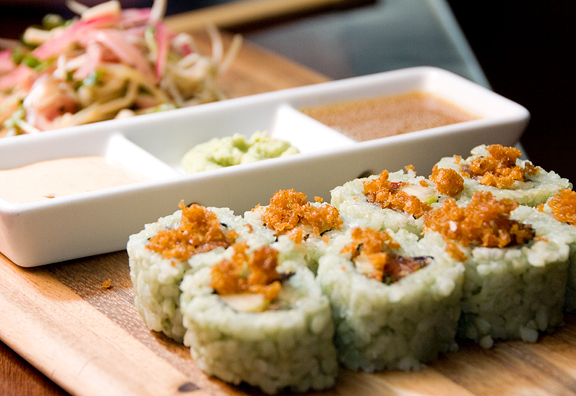 Paired with the sushi roll, it feels like you are drowing in rice. The rice of the roll is just so dominant that all I could taste was sweet rice. If I had a nice piece of hamachi or toro sashimi, I think that sake could have shot me into orbit. I had expected wine, not sake. Phil operates in a much broader foodscape (in which I include beverages) than most restauranteurs. His knowledge of flavors and how to mix and match them is really impressive and inspiring. Jeremy’s main course was the seared Florida grouper ($22). 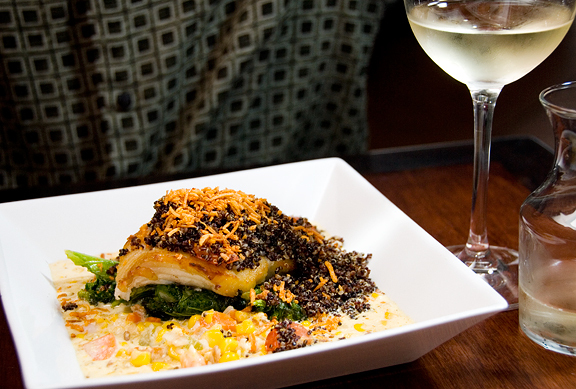 The grouper was nestled on a bed of perfectly cooked tender mustard greens (absolutely no bitterness) in a pool of smokey, peppery, buttery, lemongrass corn chowder and topped off with a generous amount of delicious coconut coriander quinoa. He *loved* it. The grouper meat was dense, yet not heavy or fishy. Instead, the meat was refreshing and clean – almost light… almost, except for the density of the flesh. Phil served us a half glass of Bodegas Martín Códax 2006 from Spain ($7 – half the cost of a full glass of my wine). I found the wine to be immensely easy and drinkable with a hint of soap midway through. It mingled nicely with the chowder and took the edge off the heavy fats. I had to order the Argentinean style skirt steak ($18), having eaten more asados than I can recall during my month in Argentina. The plate arrived with a generous pile of sliced skirt (I asked for rare and it was exactly that) on some fried yuca with yuzu chimichurri. On the side was a drizzle of soy reduction and a citrus beurre blanc. That steak was heavenly. Something that a lot of people don’t realize is that although tenderloin is so highly prized and expensive, it has moderate flavor as beef goes. Skirt has incredible flavor – the trick is to eat it rare to keep it tender since the cut is tougher. Even though they gave me a steak knife, I think this dish requires a real steak knife. However, the beef had just enough smoke from the grill to complement the beefy flavor. I liked the citrus of the chimichurri, although I also like my chimichurri with a little more garlicky umph. I was indifferent to the beurre blanc, but gushing over the soy reduction with the steak. The yuca was interesting and I admire how Chef Diego Coconati likes to experiment with foods that are healthy (or healthier) for you. The yuca is not my favorite among starches, but it really lends to that ensemble of arid climate flavors. The wine served with my main was a half glass of Santa Ema Amplus One 2004 from Chile ($7 for a half glass). This carmenere and syrah blend was so smooth and juicy. It was a full body without any of the cotton and had a nice long finish that you could nibble on. Taken with the beef, the combination is easy on the palate, although I did lose just a touch of the beef flavor to the wine. I blame the sake for my lapse in judgement. The dessert menu offers an impressive selection at Seven and that is solely because of their brilliant pastry chef, Anna Plucienkowski. How often do you want to order 5 desserts and can only hope to sample two if you manage to twist the arm of your companion to go splitz with you? Seven offers a dessert sampler platter ($25) which is really intended for 3-4 people, but we were tempted, lured, compelled to order it after reading the description. We requested that the chef go small on the portions, if possible. Anna came out to deliver the stunning arrangement of her creations – everything from scratch. We learned that Anna and Diego came to Boulder from Miami eighteen months ago. I don’t have enough space to do the desserts justice. My favorites were the chocolate hazelnut torte which had this amazing creamy texture mixed with a crispy thin wafer suspended in the torte. The espresso cream sauce was to die for, okay? I also loved the crispy wontons which were warm and so satisfyingly fruity and crunchy, perfect with the honey. The pistachio ice cream was out of this world – so good and nutty and mmmmm. The citrus white chocolate mousse parfait was a huge contrast in flavor and texture: tart and creamy, silky and crunchy (icy orange segments suspended in the tart lemon cream were awesome). The banana cheesecake was good and banana-y, but not my favorite only because the others were exceptional (and I was really really full). Anna had said the torta de queso was particularly good that day and that meant a lot to me because it says she monitors the quality of what she’s doing – what a good pastry chef can’t help but do. It was a bit rich for me, but it was smooth and creamy, a cross between a cheesecake and a flan. The blueberry-ginger compote was bright and refreshing. In fact, every time I took a bite of the cake with the compote, I felt as if I could eat more. It’s quite deceptive. I noticed a few things about Anna’s style. She does not make anything overly sweet. In fact, they were all just undersweet to the point where I felt they were perfect and allowed one to appreciate the other flavors. The sampler alone indicated her mastery of pairing hot and cold, smooth and crunchy, rich and light, tart and creamy, sharp and mellow. The combinations of flavors and twists on old classics felt very fresh, adventurous, and wholly satisfying. 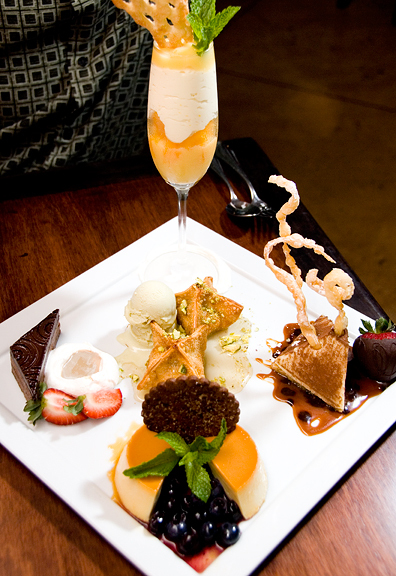 In the photo below: (from bottom going clockwise) Torta de Queso with Blueberry-Ginger Compote and Five-Spice Gingersnap, Chocolate Hazelnut Torte with Espresso Crème Anglais and Whipped Cream, (center) Crispy Wontons Filled with Mango, Banana, and Toasted Coconut Filling on Honey Drizzle with Pistachio Ice Cream, (top) Citrus White Chocolate Mousse Parfait, and Banana Cheesecake in Soy-Caramel Sauce on Sesame Crust. Other things to note… Jeremy ordered a coffee (apparently we were not charged) which he said was a dark roast Lavazza. It was very strong, not smooth, and he said he makes a much better cup at home. He gave it a C- and was quite disappointed. The cup was overly full so he could not add any cream. No matter, it wasn’t cream but some sub-whole milk which didn’t bloom those lovely lines when you pour cream or half and half into your coffee. The servers, while attentive, weren’t very good about refilling water or even the coffee (bad as it was). I think in this regard, the wait staff is trying, but they are not what I consider professional wait staff – people who really know their stuff and do it for a living, not just a job. Phil, the sommelier and part owner, was *everywhere*. It’s easy to get attention when someone knows you are writing a review, but I felt that Phil was attentive to the other guests as well as friendly and engaging and that is a very good thing. The only true fault with our dinner was the coffee, and that is very easy to remedy. Overall, I think Seven offers up some of the best value in Boulder for high quality food and wine. The service is fine, but not exceptional – although that doesn’t necessarily bother me. I think the three people at the helm, the chef, the sommelier, and the pastry chef deliver outstanding fare in a casual setting for (by Boulder standards) a good price.